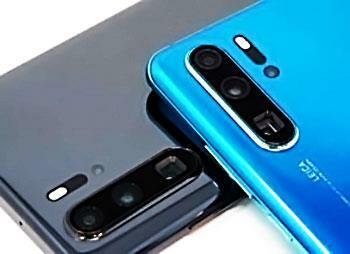 Huawei introduced the new phones in P Series a few months after its launch of the Mate series with different specifications but slightly with the Huawei P30 Pro phone you will find that the screen is larger and better with a quad rear camera instead of the triple that was previously used in the P20 Pro. To outperform, its predecessor to produce much better images especially in low light by developing the camera and the software significantly. To develop the feature of optical and digital zoom significantly with the Ultra wide 20 mega pixel camera took from newest Huawei Mate 20 Pro. The highly developed front-facing camera, similar to its former P20 Pro, plus a built-in fingerprint sensor a special technology in the handset at the bottom of the screen, Let us know the full specifications of Huawei P30 Pro and its advantages and disadvantages as follows. Durability and quality of the phone manufacture comes from glass with a aluminum metal frame. The P30 Pro phone comes with 158 x 73.4 × 8.41 mm dimensions with an estimated 192 grams of weight. The phone supports two Nano SIM cards and comes with the Hybrid SIM chipset. The phone supports all networks where 2g, 2g, 3g and 4g networks are supported, and the phone supports NFC. The phone comes waterproof and dusty with an IP68 certificate up to 2 meters in water for half an hour. Mate 20’s phone certificate the warranty does not cover damage caused by liquids such as water. The screen comes in the form of the Water Drop or the Dewdrop and comes curved from the sides to be the first screen of the P series in this format and comes with a 6.47-inch OLED-quality FHD + 1080x2340 pixels at a density of 398 pixels per inch giving a 19.5 aspect ratio 19.5:9 and supports the screen HDR10 and DCI-P3. The screen has Eye Comfort to protect your eye from blue rays. You can adjust between Normal and Vivid modes or adjust the color temperature. You can also overcome the problem of alarms by placing Always on Display You can also use the entire screen by using gestures. The processor comes from Huawei's own production where HiSilicon Kirin 980 comes from the 7nm with a Mali-G76 MP10 graphical processor with GPU Turbo performance boost, the same as the Honor View 20 phone processor. The front camera comes in mono and comes with a 32 mega pixel resolution with an f/2.4 aperture that is the same as in the P30. The rear camera comes with a quad camera from Leica Optics and comes prominently on the back of the phone, The first camera comes with 40 megapixels with the F / 1.6 lens for the Wide Angle camera and the second camera comes with 20 megapixels with the F / 2.2 lens slot for the Ultra Wide Angle The third camera comes with 8 megapixels with aperture of the F / 3.4 lens for Telephoto, while the fourth camera comes with a 3D TOF camera and a dual LED backlight. The cameras support the optical OIS and support optical zoom up to five times without loss of quality while supporting panorama, HDR and image focus, and the camera certainly supports artificial intelligence. The phone supports video shooting at 4K resolution at 2160 x 3840 pixels at 30 frames per second, FHD + 1080 x 2160 capture at 30 frames per second, 1080 FHD with 30 and 60 frames per second, Super Slow Motion HD 720p resolution at 960 frames per second. The phone supports a secondary microphone for isolating noise while talking or using the phone in recording or shooting. The first version comes with a memory capacity of 128 GB with 8 GB of RAM. The second version comes with a 256 GB internal memory with 8GB of RAM. The third version comes with a internal memory capacity of 512 GB with 8 GB of RAM. The phone supports the possibility of increasing the storage space by a memory card up to 256 GB and is placed in the second slide. We found that the speakerphone comes at the bottom of the screen unlike the P30 and also supports Dolby Atmos sound, but we found that while playing the videos, the speakers below are used only so you will not get stereo sound. The phone supports the fingerprint sensor and comes at the bottom of the screen in addition to its support for the Face Unlock feature. Bluetooth supports the latest version 5 and also supports A2DP, aptX HD, LE. Supports Wi-Fi comes with a / b / g / n / ac frequencies as well as support for dual band, Wi-Fi Direct, hotspot. 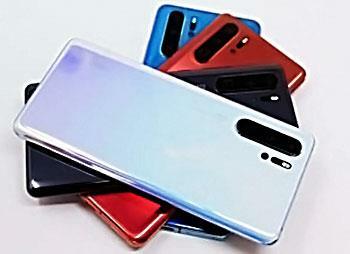 The Huawei P30 Pro also supports most sensors such as accelerometer, proximity, compass, gyroscope for VRs, color temperature sensor, and infrared sensor. GPS supports GPS and supports other navigation systems such as Dual-band A-GPS, GLONASS, BDS, GALILEO, QZSS. The USB port comes with the latest Type C, the first generation 3.1, and the OTG. The battery comes with a capacity of 4200 mAh and supports battery charging, wireless charging and reverse charging. The phone comes with Android 9.0 Pie with the latest Huawei interface with EMUI 9.1. The phone is available in more than one color with red, green, white, black and gold. The fingerprint sensor at the bottom of the screen works fast and easily. The battery lasts for a long time and also supports fast charging, wireless charging, reverse charging and long lasting because of the newer processor. Fast charging is faster than the S10 Plus, where the company announced that the phone is fully charged in less than an hour. As usual Huawei will be the best camera performance according to the evaluation of Dxomark to outperform the S10 Plus with 112 points for the back camera and Night Mode works perfectly, but the S10 Plus is superior to the front camera. You will not find a rear camera that supports optical zoom up to 5 times without losing quality and zooming up to 50x which is the best zoom. The notch is smaller than the previous P20 series and you can cancel the settings if you are not a fan but we do not know why it did not come in the most beautiful like the one in the View 20. The most powerful processor available from Huawei so far will get unmatched performance. The processor in the ANTUTU application achieved 316156 points in maximum performance mode superior to the Mate 20 Pro, although it is the same processor and also beats the Google Pixel 3 XL. There is no 3.5 mm headphone jack despite its presence in the normal P30. There is no stereo sound as previously explained through the specifications. The weight of the phone is heavier than the Samsung Galaxy S10 Plus. You will not be able to use two SIM cards and the memory card simultaneously. We did not find any information on the official Huawei's website for the protection layer used in the phone. 4K video shooting does not support 60 frames per second, even though the S10 Plus supports it. The Samsung Galaxy S10 Plus is better and more beautiful, with more accuracy and better density than the P30 Pro, but the screen in the phone is still generally acceptable. The Nano Mamery cards are not currently widely traded as they are difficult to obtain from the stores.